Hello, I am a photographer working toward supporting myself and my art photography projects full-time,through Patreon! I love photography! Kinda obvious. I've been a photographer most of my life. Documenting my experiences and visiting new places. But in a different way. I create images using my infrared camera and create sun-prints. Infrared is a technique that allows us to capture the lighting spectrum in between 700 and 1200 nano-meters (not visible for the human eye). Gives a dramatic, surreal effect, an ethereal white glow to the pictures Foliage and grass reflect infrared radiations and appear much brighter in IR Different foliage have different IR reflection as well as foliage affected by disease or insect infestation. Blue sky and water appear dark. Depending on the light, textures can be revealed in more details. Skin also can give interesting tones. One of my favorite subjects that to do well in infrared are landscapes and cemeteries. 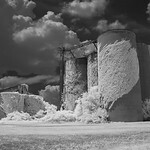 I began to re-explore infrared photography. Back in the day, 1990's , my introduction to infrared was film format. Infrared film is no longer available or extremely hard to come by, let alone having it processed. Trust me, t's a lot easier shooting infrared now compared to back then. Infrared film was too 'high maintenance' with all the special handling required. UGH! Then having the film developed, negatives not as sharp; prints grainy. At least, that's my experience. Today, infrared technology has come a long way. No special handling really to speak of with a full camera conversion option. Images are sharp,crisp and no grain. Well, if you want a grainy photo. That's where Photoshop comes in handy. In 2016, when I got a Canon mirror-less digital camera converted into a infrared camera. Then my world changed!! I just love, LOVE the 'surreal', 'creepy'and 'ghostly' effects the infrared renders. Now, I'm not limited to black and white, like infrared film. Also, I have another hidden art talent, I take some of my original photography or found objects and create art by using the power of the sun. This is called cyanotype print process. It's a 19th centery process to make copies. Cyanotype is a process developed in 1842 by John Herschel. Anna Atkins popularized it as an art form. Yes!! It is Alice Cooper with one of my cyanotype photo art. I'm very new to Patreon. Please bare with me during this learning process with this platform. I sincerely hope that you consider supporting me and my work. The money I receive will be used for my continuing education in my craft. My goal is to attend workshops in alternative photography and print processes. I would love to teach or begin a local art collective with a focus on alternative photography. Your support will be greatly appreciated!!! I do other types of photography as well, but love is art photography. I will offer you one photo downloads per year (screensaver dimensions) and access to my Patreon sponsor page. Choice of one small print (cyanotype or infrared) 20.00 value and a thank you for believing in me. If you sponsor me for $10 a month, I will offer you a choice of two images per year (sized to print 8X10, 50.00 in value, choice of cyanotype or infrared), access to my Patreon sponsor page. Plus access to $5, $10 rewards! When I reach 500.00 per month, I'll will be able to start posting more video content about my work and my process. That will be a HUGE accomplishment for me. I'm a very introverted photographer. Thank you for supporting me! !